Dominating the view of Jura from almost any direction are the three, distinctive and easily recognised, Paps of Jura found in the southern half of the island. The highest of the three is Beinn an Oir, the Mountain of Gold, is 785m/2576 ft is the only Corbett, a mountain in Scotland between 2500 and 3000 ft. Beinn Shiantaidh, the Sacred Mountain, is 757m/2477 ft and stands to the east of Beinn an Oir, while Beinn a’ Chaolais, the Mountain of the Sound, stands to the south-west and is the smallest of the three at 734m/2407 ft. Cora Bheinn, the steep mountain, stands at a height of 569 m/1893 ft to the north-east of Beinn Shiantaidh and, while not considered to be one of the Paps, is part of the same group of mountains. On one of the Paps remains of a checkpoint from the second world war can be found. There is a commanding view to be obtained from the top of the Paps on a clear day and it is well worth the effort of climbing one of them, if the weather is settled. To the north can be seen Loch Tarbert, the northern half of Jura, the Garvellachs and Mull. to the Northwest is Colonsay, to the east, the whole of Kintyre with Arran beyond, Ben Lomond and the Cobbler. To the south the Isle of Islay and Northern Ireland. 1. Take the path for Glenbatrick for about 2 miles, then skirt the south shoulder of Corra Bheinn and climb up Beinn Shiantaidh. This is a steep and difficult climb due to a large amount of large sized scree which has to be negotiated. (it is possible to go on to climb all three Paps this way, going from one to the next and return by Loch an t Soib and the Corran River). 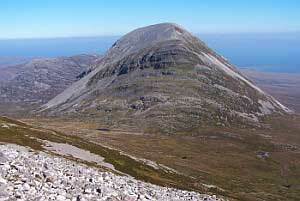 An alternate is to skirt below Beinn Shiantaidh and join route 2 at the saddle. Take care not to get too high up the slope of Beinn Shiantaidh. 2. An easier route is to leave the road at the three arched bridge and follow the Corran River to the loch. If only one Pap is to be climbed, then walk diagonally up the slope to the saddle between Beinn an Oir and Beinn Shiantaidh. Once you reach the saddle, you can decide which one to climb. Sometimes the one will be in cloud but not the other. 3. Leave the road just north of the bridge by Corran Sands. Go through the gate in the deer fence by the side of the burn. Cross over Cnoc na h Iolaine aiming for the east end of Loch a t’Siob, then join route 2. 4. From the west side. Leave the car ferry and follow the track to Inver and Cnocbreac. From here there is a circular track climbing someway up the Paps which was made for bringing down deer which had been shot by stalkers. It is necessary to leave the track at a suitable point and go across country to the Pap which you have chosen to climb. This is the longest route. The distance varies from three miles for route 1 and 6 miles for route 4 taking somewhere between four and eight hours (outward and return). The Jura Fell Race is probably one of the toughest challenges in Scotland when it comes to skills like endurance, mountaincraft and fell running techniques. 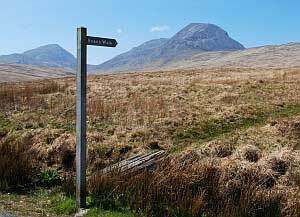 The Fell Race is held every year in the month of May and covers a stretch of 16 miles including 7 mountain summits, of which three are the Paps of Jura. The race starts and ends in Craighouse and there is a total of 7,500 feet of climbing. The fastest time ever for a man was 3:06:59 by Mark Rigby in 1994 and Angela Mudge for the ladies, she needed 3:45:31 to complete the 16 miles and 7 summits. The video (below) is an interview with Donald Booth talking about the history of the race. It was filmed at the 2007 event.